Hi, I’m Claire. 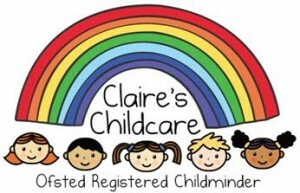 I’m an Ofsted registered childminder in Rustington. I live in Rustington with my husband and our two children. I have been looking after young children for over twenty one years, I am fully qualified in childcare and am first aid trained. I am Ofsted registered and offer a caring, homely environment for young children. I have a large play room with an open kitchen dining room, separate sleep/rest room and a well enclosed back garden. I have a good range of toys and equipment, and the children in my care can enjoy arts and crafts, messy play, cooking, music and movement, imaginative, constructive and intellectual activities, garden play and outings to the local park, library, shops and groups. I also offer seasonal themes, covering all kinds of topics, with the children’s artwork being displayed around the play area and put into folders to take home. Please view my photo gallery for an idea of my childminding service.